Registration for the 2019 International Ocean Colour Science meeting (IOCS-2019) is now open. Register early to take advantage of the heavily discounted registration rates, which apply until 31 December 2018 (see the registration page for details). Join your colleagues and space agency representatives in Busan, South Korea (9 -12 April 2019) to communicate your views, ideas, concerns and issues on all aspect of ocean colour remote sensing. The programme will include invited keynote lectures, emerging applications/science talks from space agencies, nine breakout workshops covering a wide range of topics, poster sessions and community Town Halls. Proposals for Chairs and Co-Chairs to lead and develop the scope of the nine breakout workshops can be submitted for evaluation by the IOCS-2019 Scientific Planning Committee until 15 November 2018. The NASA Ocean Color Research Team (OCRT) meeting will take place on the 8th April, 2019, prior to the IOCS-2019 meeting, along with two training courses (Copernicus marine data stream and SeaDAS) . Limited travel support will be available for graduate students. See the IOCS-2019 meeting website for further details. The final version of the IOCCG Report on “Earth Observations in Support of Global Water Quality Monitoring“, edited by S. Greb, A. Dekker and C. Binding, is now available for download on the IOCCG website at http://ioccg.org/what-we-do/ioccg-publications/ioccg-reports/. 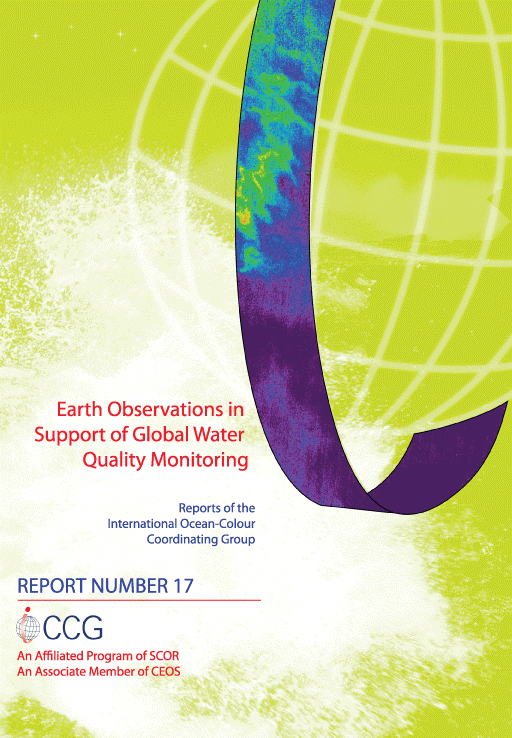 This report aims to strengthen linkages between data providers and end users by providing detailed information needed to support the development of an EO-based global water quality monitoring service. Current knowledge and gaps regarding coastal and inland water quality, and associated use of remote sensing data are described. Existing space-based and in situ observing capabilities are also assessed. The report identifies user needs and requirements, observing capabilities, new and improved data streams and products, mission requirements, supporting research, and best practices. The report has been printed by the State Key Laboratory of Satellite Ocean Environment Dynamics, Second Institute of Oceanography, China, which is gratefully acknowledged. Hardcopies of the report can be requested at: http://ioccg.org/request-hardcopy-ioccg-report-17/. The number of printed copies will depend upon requests received, so please submit your requests as soon as possible. NOAA recently printed copies of Reports 15 and 16 which is gratefully acknowledged. Copies of these reports will soon be mailed to those who have requested them in the past. All 17 IOCCG Reports published to date have been deposited into the OceanBestPractices (OBP) repository to enhance their scientific and outreach value. OBP is an open access, permanent, digital repository of community best practices in ocean-related sciences maintained by the International Oceanographic Data and Information Exchange (IODE) of the UNESCO-IOC. The IOCCG Reports will be more easily findable and citable since a DOI has been issued for each report. The OBP is indexed by all the major search engines and harvested by repository aggregators. See the IOCCG Community on the OBP website for the complete list of IOCCG Reports and their corresponding DOIs. The IOCCG reports are also available for download from the IOCCG website at: http://ioccg.org/what-we-do/ioccg-publications/ioccg-reports/. If you have a new email address, and were wondering how to update your information in the IOCCG Mailing List, please unsubscribe using your old email address (see unsubscribe link at the bottom of this news bulletin), then re-subscribe using your new email address at: http://ioccg.org/news/subscribe-ioccg-mailing-list/. Regarding your physical address for receiving hard copies of IOCCG Reports in the mail, users will be asked to provide a mailing address for each new report requested, using the online form. Several months are required for printing and mailing of a new report, so please provide an address where you can be reached for the next ~6 months. Under the auspices of the IOCCG and NASA, Ken Voss and Giuseppe Zibordi have volunteered their time and expertise to update the in situ radiometry protocols published nearly 15 years ago as part of the NASA Ocean Optics Protocols for Satellite Ocean Color Sensor Validation. 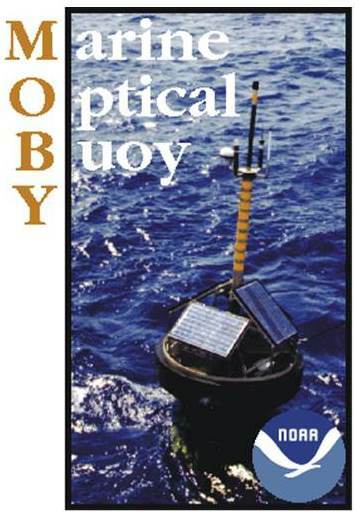 This updated draft protocol document entitled “Protocols for Satellite Ocean Color Data Validation: In situ Optical Radiometry” is now available for a public comment and review on the IOCCG website. Please email comments on the document to: aop_comments@oceancolor.gsfc.nasa.gov (comments are forwarded to Ken Voss and Giuseppe Zibordi). The document aims to support the ocean colour community with protocols for the collection, processing and quality assurance of in situ measurements of the apparent optical properties (AOP) of natural water for the validation of satellite radiometric products. After the review period, the document will be revised based on comments received, formatted, and a final pdf document will be posted onto the IOCCG website. Periodic updates to the “final” version of this protocol document are planned to account for new and emerging technologies and deployment approaches. Furthermore, we anticipate that the community of experts will prepare additional in situ radiometry protocols to address topics that extend beyond the validation focus of this current protocol. Three members of the ocean colour community have kindly offered to serve on the Editorial Review Board for this report: Robert Foster (Naval Research Laboratory), Dariusz Stramski (Scripps) and Susanne Craig (NASA GSFC). 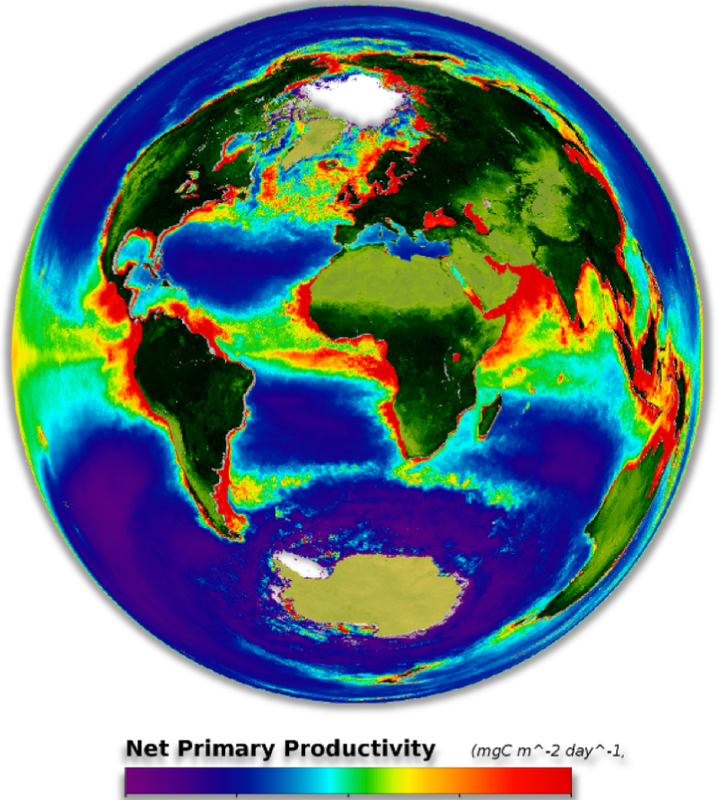 The NASA PACE project, in collaboration with IOCCG, have initiated a new working group to establish standard, community-consensus field protocols for measuring aquatic primary productivity in coastal and ocean waters across diverse methodologies. 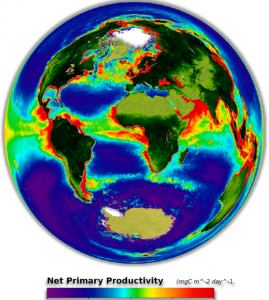 The working group will meet on 5-7 December 2018 (Columbia, MD USA, https://pace.oceansciences.org/events_appw.htm), to work jointly in the development of a set of community consensus protocols for carrying out in situ measurements of primary productivity and related parameters. The final protocol document will eventually be included in the new IOCCG Protocol Series, which includes the Ocean Optics & Biogeochemistry Protocols for Satellite Ocean Colour Sensor Validation. The objective is to generate recommendations for best practices to homogenize methodologies, and to account for known artifacts and sources of error across the various measurement approaches. Former IOCCG member, Dr. ZhongPing Lee, was recently elected a Fellow of the Optical Society of America. 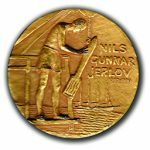 He was recognized for his “Outstanding contributions in ocean optics and ocean colour remote sensing and breakthroughs in underwater visibility theory.” A big congratulations on behalf of the IOCCG Committee! 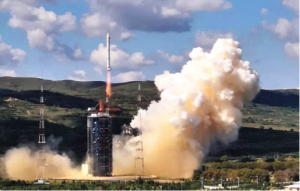 China successfully launched its third satellite in the Haiyang-1 series, the HY-1C ocean colour satellite, on 9 September 2018, from the Taiyuan Satellite Launch Center in north China’s Shanxi Province. 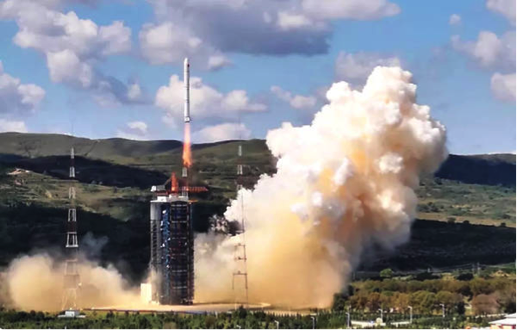 China’s first marine satellite, HY-1A, was launched in May 2002, laying the foundation for an ocean monitoring system, followed by the launch of the HY-1B satellite in April 2007. The design life of the HY-1C satellite is five years. HY-1C can detect chlorophyll, suspended sediment concentrations and dissolved organic matter (which influence the colour of the ocean), as well as sea surface temperature, contributing to research on the global oceanic environment. Data from HY-1C will also be used in surveys of resources and the environment of China’s offshore waters, islands and coastal zones, marine disaster relief and the sustainable utilization of ocean resources. HY-1C is expected to improve China’s ocean remote sensing capability, along with HY-1D, which is planned for launch in 2019. NASA Plankton, Aerosol, Cloud, ocean Ecosystem (PACE) mission, scheduled for launch in late 2022, promises to enable new insight into oceanographic, biological, and atmospheric responses to Earth’s changing climate. All three of the mission’s payload instruments recently successfully completed their Preliminary Design Reviews (PDRs). PACE’s primary instrument is a tilting, global spectrometer called the Ocean Color Instrument (OCI) – see https://pace.oceansciences.org/oci.htm for further details. 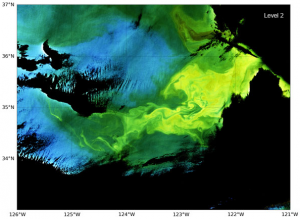 These three instruments will enable improved understanding of aquatic ecosystems and biogeochemistry, provide new information on phytoplankton community composition and improved detection of algal blooms, advance aerosol, hydrosol, and cloud characterizations, and provide opportunities for novel ocean color atmospheric correction. On August 7th 2018, an interagency workshop on societal applications of satellite data for the Chesapeake Bay was hosted at NASA Goddard by Stephanie Schollaert Uz (NASA), with assistance from Kevin Turpie (NASA/UMBC), Chris Brown (NOAA), and others. 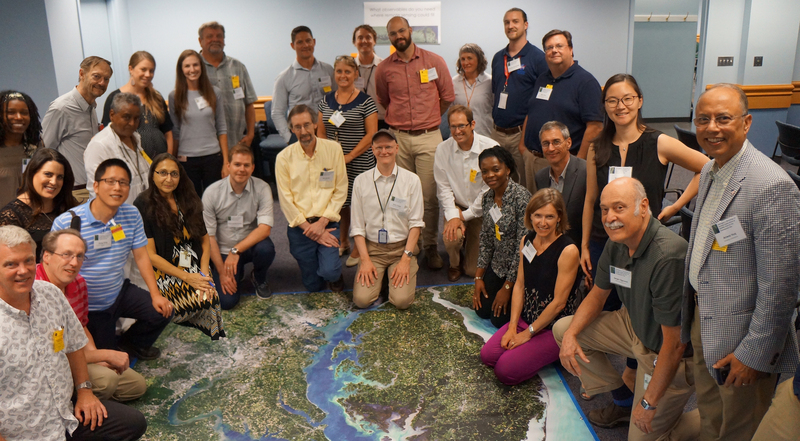 The workshop brought together satellite data providers, scientists and resource managers around the topic of coastal and inland aquatic ecosystems and water quality. Panel discussions focused on quantifying ecology, human health, and land-water interactions, with a keynote presentation on a multidisciplinary project that applies satellite data toward early warning of Vibrios using temperature, precipitation, and chlorophyll combined with information about water insecurity. Objectives of the workshop included exchanging ideas across the aquatic community and prioritizing applications requirements as input to the proposed NASA Surface Biology Geology (SBG) mission. Presentations included Antonio Mannino (NASA) on PACE and 20 years of Chesapeake Bay field work, Kevin Turpie (NASA/UMBC) on next generation space-borne aquatic sensor (HyspIRI/SBG), Ryan Vandermeulen (NASA/SSAI) and Grace Kim (NASA/USRA) on novel methods of quantifying ecology through spectral signatures and modeling, and predicting phytoplankton biodiversity, respectively, and Rick Stumpf (NOAA) on harmful algal blooms. 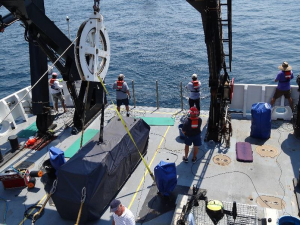 A total of 95 participants included federal, state, and local agencies (i.e., NASA, NOAA, USGS, NRL, EPA, FWS, Maryland DNR, MDE, Prince William County), NGO’s, universities. One outcome of this workshop will be a future effort to integrate in situ and remotely sensed observations with regional modelling efforts. The Gold directory has MOBY satellite weighted data for the following missions: VIIRS SNPP (including I-bands) and NOAA-20; OLCI S3A; SGLI GCOM-C; OCM2; MODIS Aqua, Terra and Land; SeaWiFS. Deploying four Hyperpros simultaneously from the stern of the NOAA Ship Okeanus Explorer during the 4th annual NOAA dedicated JPSS-VIIRS Cal/Val cruise. The fourth NOAA annual dedicated JPSS VIIRS Cal/Val Cruise was completed in May 2018 (FY2018) aboard the NOAA Ship Okeanus Explorer. That cruise left from Key West, FL, US sampled into the Gulf of Mexico and then up the Florida Atlantic coast, ending in Jacksonville, FL, US. The clear-sky matchups-to-station days ratio was the highest to date for SNPP (17 out of 24 stations, ~70%) for these dedicated NOAA cruises. The 5th (FY2019) NOAA cal/val cruise will be 16-25 May 2019, back on the NOAA Ship Nancy Foster and will depart from Charleston, SC, US and end in Key West, FL, US. 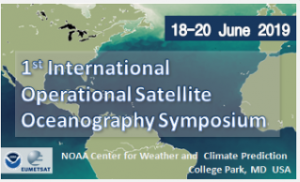 The First International Operational Satellite Oceanography Symposium initiated jointly by NOAA and EUMETSAT, and endorsed by several international organizations (including the Coordination Group for Meteorological Satellites (CGMS), Intergovernmental Oceanographic Commission, of the United Nations Educational, Scientific and Cultural Organization (IOC-UNESCO) and Pan Ocean Remote Sensing Conference (PORSEC)) has been extended to a 3rd day. The Executive Steering Committee met in September [during the EUMETSAT Meteorological Satellite Conference] to draft the themes, framework and expected outcome of the symposium, and the Programme Committee, which will consist of approximately 20 members representing a diverse array of the community, will be finalized by the end of October and start the detailed planning of the symposium’s agenda shortly thereafter. Plan to attend now on 18-20 June 2019 at the NOAA Center for Weather and Climate Prediction in College Park, MD, in the Washington DC area. A training day on Monday 17 June 2018 is also being planned. Click the graphic below to link to a flyer with more information. Sentinel-3B successfully passed its In-Orbit Commissioning Review (IOCR) on 17 October 2018. Since 16 October, the satellite is being moved away from the tandem configuration with S3A to its nominal orbit of 140 deg ahead of S3A. The nominal orbit will be achieved on 23 November. The transfer of spacecraft operations from ESA to EUMETSAT is planned for the end of November 2018. Public release of S3B OLCI L1B products is expected during the time frame end-of-November/beginning-of-December 2018. Meanwhile, Sentinel-3A OLCI performance remains nominal, and all S3A instruments continue to operate within expected parameters. There will be an invitation session to report the results from the Copernicus Sentinel-3A and S3B tandem phase at the Living Planet Symposium 2019. This will be held in Milano, Italy and details can be found here. The Copernicus Sentinel-3 Mission is an operational constellation consisting of at least two satellites in orbit at any one time to attain the required coverage as specified by Copernicus Services. The mission includes four satellites in total. To address subtle but important differences between the recurrent sensors on Sentinel-3A and Sentinel-3B that might impact the construction of climate data records, at the start of the Sentinel-3B mission between June and October 2018 the two satellites were flown in close “Tandem” formation. This is a first within the Copernicus constellations. Based on GCOS climate monitoring principles, the “Tandem” formation entails Sentinel-3B flying 30 seconds ahead of Sentinel-3A. This configuration is designed (1) to increase knowledge of Sentinel-3 constellation payload differences (2) to reduce uncertainties when comparing data from different satellite missions within the constellation and (3) to homogenise differences within the Sentinel-3 constellation payload by defining appropriate adjustments. The intended outcome is a uniform data set from Sentinel-3A and Sentinel-3B instruments. In addition, the Tandem Phase allows the exploration of fundamental altimeter measurement approaches (SAR and LRM mode) that has never been possible before. 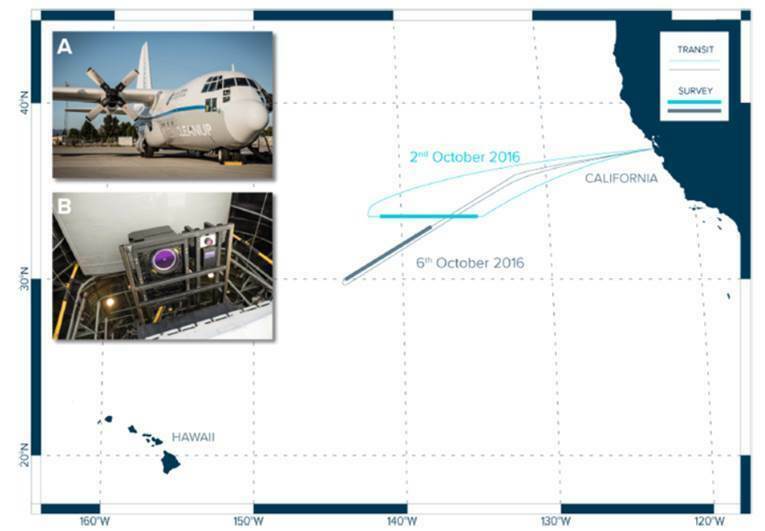 This session will review early results from the Sentinel-3 Tandem phase. Use this dedicated link to make your submission. Consistent OLCI-A time series is available to users. L1B and L2 marine products from 26 April 2016 to 29 November 2017 have been reprocessed and are available via the CODAREP website (https://codarep.eumetsat.int). Operational products from 29 November 2017 are hosted on CODA (https://coda.eumetsat.int). To keep up to date with information pertaining to ongoing Sentinel-3 ocean colour products and calibration/validation, the community is encouraged to register at, and monitor, the EUMETSAT Copernicus Marine User Forum (https://forums.eumetsat.int/forums/forum/copernicus-marine-calval/). All discussions relevant to the timelines for OLCI-B data availability and the status of both OLCI instruments will be posted here. The forum moderators welcome any and all questions pertaining to any Sentinel-3 sensors. Further information on OLCI ocean colour products can be found at: https://www.eumetsat.int/website/home/Data/Sentinel3Services/OceanColour/index.html. EUMETSAT continues to extend its catalogue of online training resources for Sentinel-3 marine product users. New web-tutorials focussed on managing netCDF data are on https://www.youtube.com/watch?v=XqoetylQAIY. This four-part video walks users through a series of strategies for visualising, mapping and interrogating data from multiple sources, including approaches to automation, and is applicable to ocean colour users from Level 1B to Level 4. This video builds on previous resources on how to access and visualise Sentinel-3 marine data across all sensors. The XXIV Ocean Optics conference recently took place in Dubrovnik, Croatia between 7 and 12 October 2018. This was a very successful event with a total of 337 attendees from 35 countries, 76 of whom were students (22.5% of the total). Emanuelle Organelli received the Best Speaker award, Ryan Vandermeulen the best poster award and Alexandre Castagna the best student paper award. 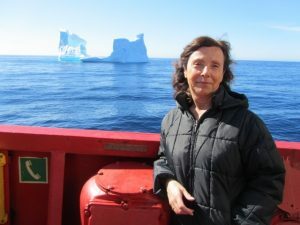 In addition, the prestigious Jerlov Award was granted to Dr. Annick Bricaud in recognition of her contributions to the advancement of our knowledge of the nature and consequences of light in the ocean. Dr. Bricaud is internationally recognized for her groundbreaking contributions to ocean optics through experimental and theoretical studies on seawater optical properties, fieldwork-based bio-optical relationships, and algorithms for deriving biogeochemical products from satellite ocean colour. 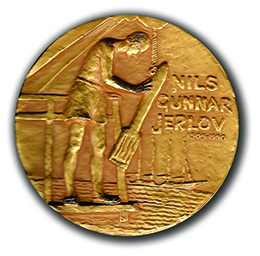 She is a senior research scientist at the Laboratoire d’Océanographie de Villefranche (LOV), CNRS – Sorbonne Université, Villefranche-sur-Mer, France, which she joined in 1976. Her numerous papers were highly influential and many opened new avenues of research. Annick mentored numerous students in France and worldwide, and has a long record of contribution to community service. She is among the first female researchers in optical oceanography. On behalf of the IOCCG Committee we congratulate Dr. Bricaud for her achievements and contributions to optical oceanography and ocean colour. Several journals are offering special issues in the coming months. The journal Remote Sensing is offering two special issues related to ocean colour remote sensing. The first will address “Earth Observation and Sustainable Development in Marine and Freshwater Systems”. This special issue will include contributions that address the power of Earth observation to support our ability to address issues related to sustainable development in marine and freshwater systems. Examples include remotely-sensed metrics of marine ecosystem status, fishery potential estimated using ocean-colour data, surveillance for governance on the high seas, and so on. Click here for further details about the “Earth Observation” special issue. Comparison of remote-sensing ocean primary production estimates and biogeochemical model simulations. Click here for more information on the “Primary Production” special issue. The journal Sensors is offering a special issue on “Remote Sensing of Ocean Colour: Theory and Applications“. Click here for more information about the scope of this special issue in Sensors. The FLEX Organising Committee invites you to register for participation and to submit a paper to the 2019 International Network on Remote Sensing of Terrestrial and Aquatic Fluorescence Workshop: fluorescence2019.org. FLEX 2019 will take place in Davos, Switzerland, from the 5th to the 8th of March 2019. Several new publications have been added to the IOCCG Recent References list including a paper by Ohde (2018) who studied the impact of the El Niño-Southern Oscillation (ENSO) on the surface sulphur plumes off the Peruvian upwelling system using MERIS and MODIS data. The investigations demonstrated a strong correlation between the ENSO and the sulphur plumes in the coastal areas of Callao and Pisco. During the El Niño phases, the sulphur plumes disappeared almost completely because of equatorial remotely forced oxygenation episodes. 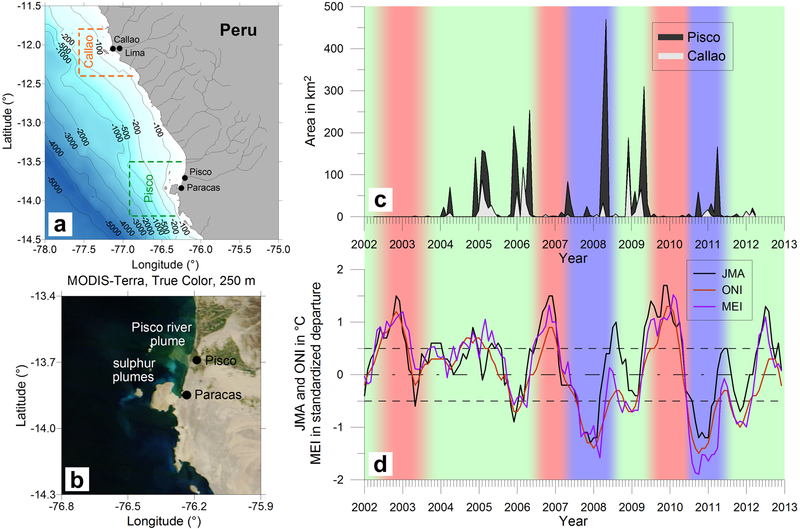 The La Niña events were associated with strong oxygen deficiency over the Peruvian shelf, supporting the formation of hydrogen sulfide and, consequently, the occurrence of sulphur plumes. This impact was smaller at Callao, because the La Niña phases in this coastal area were interrupted by weak oxygenation events. During the neutral phases, oxygen-poor waters were also present in the Peruvian shelf areas, promoting the large size of sulphur plumes. However, they were not forced by the remotely driven processes resulting from ENSO phenomena. (a) Study areas of Pisco and Callao including the bathymetry. (b) Sulphur and river plumes at Pisco in a MODIS-Terra scene on April 15, 2009. (c) The sulphur plume sizes at Pisco (black curve) and Callao (gray curve) are shown, derived from MERIS using an identification algorithm for sulphur plumes. (d) ENSO indices superimposed (see https://doi.org/10.1029/2018GL077618 for details). In another new publication by Shenglei Wang et al., (2018), the authors develop a new trophic state assessment method for global large inland waters using MODIS and Forel-Ule index (FUI). Through tackling the challenge of the use of RS techniques for the trophic state assessment of inland waters on a global scale, this research produces the first global trophic state map for 2058 large inland water bodies, and presents the spatial distribution of the trophic status of global large inland water bodies in the summer of 2012. Of the global large water bodies considered, it is found that eutrophic water bodies accounted for 63.1% of the total number but only 30.5% of the total surface area, mesotrophic water bodies accounted for 26.2% of the total number and 39.4% of the total surface area, and oligotrophic water bodies accounted for 10.7% of the total number but 30.1% of the total surface area. Oligotrophic large lakes are found to be concentrated in plateau regions in central Asia and southern South America, while eutrophic large lakes are concentrated in central Africa, eastern Asia, and mid-northern and southeast North America. Trophic state classification of global inland waters in the austral and boreal summers of 2012 assessed using the FUI-based method. Blue spots denote oligotrophic water bodies, green spots denote mesotrophic water bodies, and red spots denote eutrophic water bodies. 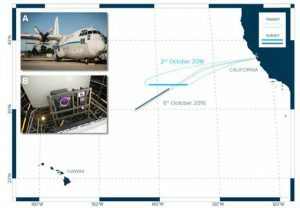 Recently, Garaba et al., (2018) presented a proof-of-concept aerial survey that was led by The Ocean Cleanup Foundation, Netherlands over the North Pacific ‘Great Pacific Garbage Patch’ that showcased the potential application of a hyperspectral shortwave infrared imager (ITRES SASI-600, SWIR 950-2450 nm) and a true color RGB camera (Optech CS-4800i 16 megapixel frame camera) in detecting and distinguishing floating and slightly submerged ocean plastics. Aboard a manned International Air Response Lockheed C-130 Hercules aircraft on October 2 and 6, 2016 flying at an altitude of 400 m above sea level at 140 knots, trained observers recorded the geolocation, object size distribution, color of 1595 floating and slightly submerged objects. These objects were further subdivided into five categories (i) container − rectangular bright objects such as fishing crates and drums; (2) float − rounded bright objects; (3) ghost nets − either a colorful group of various fishing nets bundled together or a single translucent fishing net; (4) rope – long cylindrical objects around 0.15 m thick; and (5) unknown −objects that were clearly debris but whose object type could not be identified. The largest 30 objects within each category were then used to investigate the hyperspectral SWIR at-sensor spectral radiance properties. RGB image frames were visually inspected to classify and geolocate the objects and the spectral information was retrieved from the SWIR imagery. The absorption features reported in an earlier study (Garaba and Dierssen, 2018) at 1215 nm and 1732 nm were shown to be useful indicators for detecting and quantifying of ocean plastics. Study findings suggest airborne remote sensing has the capability to complement monitoring activities related to marine litter pollution and will be useful in exploring satellite remote sensing of ocean plastics. Other new publications include several articles on the adjacency effects (AE) in ocean colour remote sensing. Bulgarelli et al. (2018) investigated the minimization of AE in SeaWiFS primary products at the Aqua Alta Oceanographic Tower (AAOT) using sample images concurrent with in situ measurements. The validation exercise was performed with the NASA SeaDAS processing scheme ingesting original SeaWiFS data and alternatively SeaWiFS top-of- atmosphere data corrected for AE, and additionally including and excluding the default turbid water (TW) correction algorithm. Results show overestimates of the TW contributions partially compensating for AE. The analysis also suggests that intra-annual biases observed in SeaWiFS radiometric products at the AAOT may result from a misinterpretation of the NIR atmospheric signal as water contribution in data acquired in winter, and from uncompensated AE in data acquired in summer. Bulgarelli and Zibordi (2018a) theoretically investigated the impact of AE on ocean colour remote sensing for a wide range of terrestrial land covers and water types usually encountered in mid-latitude coastal environments. Bulgarelli and Zibordi (2018b) highlight the remarkable seasonality of the impact of AE on satellite ocean colour data for the specific case of the AAOT AERONET-OC validation site located in the northern Adriatic Sea. Another new publication is the full Copernicus Marine Environment Monitoring Service (CMEMS) Ocean State Report – Issue 2. CMEMS Ocean State Reports rely on the unique capability and expertise that CMEMS gathers in Europe to monitor, assess and report on past and present marine environmental conditions (physics and bio-geochemistry) and to analyse and interpret changes and trends in the marine environment. The second issue of the Ocean State Report consists of four principal chapters which discuss; i) the selection of Essential Ocean/Climate Variables, ii) an analysis of changes in ocean climate, ii) characteristic changes in the European regional seas, and iv) a specific focus on anomalous changes during 2016. Ocean colour analysis forms a key pillar of this report, featuring in multiple sections. Section 1.5 presents the analysis of trends in consistently processed, multi-sensor, global and regional Ocean Colour time series, spanning 1997-2016. With the exception of in the Black Sea, an increasing trend in chlorophyll concentration is observed throughout European Seas in this period. Global chlorophyll trend analysis shows an increasing trend in high latitudes and a decreasing trend in tropical areas over the past 18 years. Variations in phytoplankton can be linked to climate indices that ultimately represent regional ocean physics and broader climate oscillations. Section 2.6 showcases the correspondence between El Niño–Southern Oscillation (ENSO) and interannual variations in phytoplankton chlorophyll concentration in the Pacific Ocean. The 2015-2016 ENSO event was the strongest observed since 1997, and resulted in a large reduction in phytoplankton chlorophyll concentration in the Equatorial Pacific Ocean. These regional responses to climate variability are critical to understand how phytoplankton might respond to long-term climate changes. In Section 3.7, the eutrophication status of the Baltic Sea is assessed by combining multiple CMEMS modelling reanalysis and earth observation products, to complement and improve ocean monitoring capabilities. Due to a combination of anthropogenic over-enrichment and climate change, the Baltic Sea is a eutrophicated marine area. However, while nutrient inputs have decreased in the last two decades, no decline in eutrophication effects have been documented, with high concentrations of chlorophyll-a still observed every summer. Ocean colour data were analysed to provide time series of the spatio-temporal coverage of surface and subsurface summer blooms. The full CMEMS Ocean State Report – Issue 2, and it’s summary, can be downloaded from http://marine.copernicus.eu/science-learning/ocean-state-report/ocean-state-report-2nd-issue/. Several new positions have been added to Employment Opportunities on the IOCCG website including PhD/Postdoctoral fellowships in Germany (Helmholtz-Zentrum Geesthacht and University Oldenburg), USA (Florida Atlantic University) and Canada (Université du Québec à Rimouski) as well as a position for a remote sensing scientist (EUMETSAT, Germany), a Senior Lecturer/Associate Professor at the University of Stirling, UK and a Software developer at NASA GSFC, USA. For further details on these positions see: http://ioccg.org/resources/employment-opportunities/.